I have been to India many times and have traveled there sometimes on back roads. People are a little afraid of going to India – it seems unmanageable – and in a way they are right, it is unmanageable. But India can be experienced and enjoyed without trying to manage it. This essay combines four memos I have written for different people, suggesting approaches to traveling there. India is the most astonishing place I have ever been, which is why I keep going back. It is worth whatever effort and compromises it takes to see it. Jai Hind! Jai Hind! means, more or less, Yay India! It is sort of an Indian version of Vive la France! Yes, India is a difficult environment. But you can insulate yourself from a lot of discomfort and inconvenience with just a small amount of money. Yes, India is hot, but not in the middle of the country (where Delhi, Agra, Varanasi and Rajasthan are) in the wintertime. Yes, there is a lot of visible poverty – but there are people living on the streets of every American city, too. Yes, India will take some getting used to – when you go, be prepared for things to be very different. But yes, you can do it. And like everyone who has gone there before you, you will see and experience a place so breathtaking and dazzling it is like no other in the world. And no, you don’t need to go there on a tour. You need a visa to enter India. India outsources visa processing now; at the moment the provider seems to be M/s Cox and Kings Global Services Pvt. Ltd. (CKGS). Check your local Indian consulate website for the latest information. December to February are good times to travel to India – after that it begins to get very hot. In January Delhi feels like San Francisco, down to the fog. By May it can be 110 degrees. It is always hot in the south but it gets hotter as the year wears on. In the North (Kashmir, a few other places), it is really cold in the winter. To go there in the summer you should fly directly there, changing planes in Delhi but not leaving the airport. I haven’t been to the far east – Assam and nearby states. India is a demanding environment health-wise. Get a typhoid shot. Definitely get a polio shot. A Havrix shot or some equivalent is good to protect against hepatitis and to boost the immune system against the constant coughing and sneezing you will encounter. Skip the cholera shot ‒ it is a live vaccine of only partial effectiveness, and you can avoid cholera by not eating fish or shellfish, which you shouldn’t do in India anyway. Skip yellow fever too – you don’t need it for India. Malaria pills are a good idea even in the winter. If you don’t have an official yellow booklet listing all your inoculations and their dates, get one now wherever you get your shots, bring it with you, and keep it up to date. Know where you want to go, and what you want to see, by having read a guidebook in advance. Lonely Planet Guide to India is good for getting around, but not as good on what to do when you get there. Try the Rough Guide for that. Insight guides are usually very good also. You can insulate yourself from some of the nitty-gritty of India by staying in decent hotels, using reservations available on the Internet (tunnel down through listings for Indian states, cities, tourism, lodging). A good hotel with a city view, private bathroom with hot and cold running water, elevator, room service, dining room, phone, English-speaking staff, etc., costs less than a Best Western in North Carolina. You can live much simpler, and that can be fun too, but at Indian prices you don’t need to. It’s good to embrace the nitty-gritty of India, but I find it is also good to have a refuge at the end of the day where you can eat the food and take a shower and sleep in a western bed. You will only need air conditioning in the hot months, or in the south, but a/c is often code for a nicer room – if some rooms have a/c and some don’t, you might not want to stay in a room that doesn’t. Make sure in advance that your room is not next to the auxiliary generator. Indian electricity goes out every day and generators are essential, but maddeningly noisy. You will not enjoy being next to it when it is running. Arrange with your hotel to have a driver meet you at the airport to take you to the hotel. He should be waiting outside the customs hall with a sign with your name on it. Especially if you are new to India, you might not want to chance taking a random taxi, whose driver might try to divert you to another hotel. India is confusing enough at first – let your hotel send someone to catch you. Unless you have been to India before, nothing can prepare you for what you will experience. It is stunning. That’s good, it’s what you went there for! But still: expect some disorientation. India is a shock to every first-time visitor. You have to allow a few days to get over it. You will compound this effect severely rushing yourself, or trying to do too much. Jetlag may be a problem – Delhi is 12½ hours later than California, 9½ hours later than New York. Take sleeping pills with you. Use them to sleep on the plane, so you are not a wreck when you get there, and use them to regularize your sleep while in India, because you will be off by many time zones. Don’t have business meetings the first day or two – this is not London. There is no point in trying to make India work like America. Accept some discomfort, some inefficiency, and a certain level of squalor (although not necessarily squalor for you personally). This is good advice for any trip, but it is especially important for India. Slow down! Pace yourself! One reason people try to do too much is that they overstuff their itineraries. Let’s go here, and here, and here, and allow one day for here, and there is not that far from here, we could go there too! But doing too much in a short time means you don’t have a chance to see much more than the peak tourist sights. And it means you are always rushed, and pressured, and your experience of wherever you are is severely limited by having only a short time there because you have so many other places to get to. And it means little rest and swift frazzlement. Instead, give yourself enough time to experience where you are, for as long as it takes you really to do that. How long that will take you won’t know until you’re there. As long as you are having a rich experience where you are, stay there; don’t move on until you feel that’s enough and you’re really ready for something new. Deep experience of new places is why you’re here, not just to check off cities or sights on a list. Rushing from place to place only ensures a degraded experience everywhere. India is full of fabulous places, and you won’t see them all on this trip, or maybe ever. This is true of Europe too, and of America, and of everyplace. The important thing is to be open to experiencing where you are without feeling time pressure to move on; and when you do move on, then experience the new place in the same unhurried way. One of the great lessons of India is to slow down. So I recommend allowing several weeks for a first trip to India – three weeks is about the minimum, because as noted you will be a little disoriented at first. Five or six weeks would be ideal if you have the time, but you can have a terrific experience in three. You will probably arrive in Delhi (although there are other international airports in India), so spend some time there, and then go to one other place and spend some time there, and then decide what to do next, if indeed you have time for anything more. Travel within India can be arranged quite painlessly from your hotel without any significant advance planning, especially if you’re not on a tight schedule, which you should not be. Don’t block it all out up front if you can help it (and why couldn’t you help it?). At the end fly back to Delhi for the trip home, or instead plan to leave from somewhere else. So much of the beauty and charm of India is in unscripted moments – the clink of anklets on women’s feet, the colors in a marketplace, a tug of war between a donkey and a vegetable seller, a wheelwright or blacksmith or goldsmith beside the road, children playing cricket, fishermen bringing in their nets. Don’t miss it, or fail to notice it, because you’re in a hurry. Visit temples and take your time there – don’t just go for the architecture, but stay for an hour or so, or longer, and hear the music and dig the vibes. A place looks very different after two or three hours than it does after ten minutes. Walk along the ghats at your leisure – no hurry! India is vastly more than a collection of five-star sights. You have to stop moving to appreciate it. What you see during those three weeks, you see; what you don’t see will be there for next time. Trying the whirlwind approach is exhausting, it will be a blur, you won’t have fun, and the faster you go the more you will be forced onto the deluxe path of fancy hotels and guided tours and the less you will see of actual India. Twenty feet off the main highway is another India entirely, which you can only see if you arrive in a private car and are not in a hurry. One specific recommendation (for all travel, not just India) is to take one day a week completely off. Stay in your hotel, read a book, take naps. Don’t feel you have to explore just because you’re in a foreign country – in fact, make it a rule not to explore on this one day a week, which I call shabat (Hebrew for sabbath). If you do this, you can get enough rest to keep going; if you don’t, and do tourism every single day, you will burn out quickly. Hotels in India range from five-star Oberoi blowouts to concrete hovels in back alleys. But as noted, respectable three-star hotels with all you might need – hot shower, western toilet, air conditioning, English-speaking staff, and probably a restaurant and wi-fi, can be had for less than an American Best Western, and often for the price of a Motel 6. Shop around on the Internet for Delhi accommodations – TripAdvisor is a useful site. You can probably find equally good lodging in other places on the Internet, or through a travel agent in India, after you know when you’re leaving Delhi, a decision you should not make yet. If you reserve your post-Delhi hotel before you leave you will be needlessly constraining your schedule and freedom of action in India. Rely on your hotel staff and driver. Ask for what you want. Where can I find English books? Where are the elephants? How can I get to hear Indian classical music? Where can I have shirts made? Where is the Ganesh temple? If you like rare books or silk or small bronzes or whatever, never mind that a driver will take you to his friend’s shop. That’s OK, and the shop is likely to be in a quarter with a hundred similar shops. Look around. There is bountiful everything in India if you can pay modestly for it. Your hotel can help you with cars and travel arrangements. The cleanest laundry in the world is done by Indians, beating rocks with your clothes in the filthy river – it is a wonder of nature. A local travel agent will get train tickets for you and make hotel reservations if you need them, help you reserve at the state park tourist lodges, etc. Language will be a problem in many places once you leave the main tourist path, and sometimes even while still on it. There is always someone around who speaks English, but on back-street rambles it is not always clear who that might be. On my first trip to India I found it helpful sometimes to ask the hotel to find me an English-speaking student who spoke English to be my interpreter on adventures in the old city – not a tour guide, just an interpreter. Tip very generously. That is our role over there as rich Americans. Everything is so cheap you can afford to be lavish. The key to a good experience as a tourist in India is to accept help and overtip. Be extra-careful what you eat, to avoid getting sick. See my essay on how not to get sick in the Third World. Be fanatical about this. Always check the seals on the bottled water — there is a dodge refilling old bottles with tap water. And don’t let any shower water enter your mouth! Keep a towel handy just in case. Really. Two contradictory rules about India. First, do things the Indian way, and don’t buck it or get impatient that things don’t happen with American speed and efficiency. It all works out somehow. The cows in the road pass you without incident. You give the wallah your laundry and you think you may never see it again, but it will come back cleaner than you could get it in France. India is not going to change for you – you need to adapt, or you will get angry and frustrated when you should be enjoying a change of culture. For example: when a tradesman says your order will be ready at three, he means come around three but be prepared to wait around indefinitely drinking tea while he sends someone across town to get it. This is not negligence, it is custom. Expect this. See if you can make an arrangement for the thing actually to be there when you arrive, but if you can’t, or if you think you have arranged for it but it is still not ready at three, roll with it. It’s better that way. Yes, do it their way, but on the other hand in India you can always buy as much additional convenience and comfort as you want or think you need, by spending not very much additional money. In the case just mentioned, instead of going to the shop yourself to pick up the goods, you could ask your hotel to send a wallah to pick them up, or send a three-wheeler. It is the way Americans used to travel in Europe in the novels of Henry James – you can afford that style of living in India, and the locals are glad of the business and glad to be overtipped. 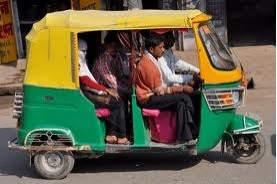 There are four options for getting around in Indian cities: on foot, in a car (usually a taxi), or in a three-wheeler (sometimes called a tuk-tuk from the sound of its exhaust) or bicycle rickshaw. Forget about using public transport – the buses, as well as being so overcrowded people hang onto the back and ride on the roof, operate entirely in Indian languages. Even if you could get on, you wouldn’t know where to get on, or which one to get on, or where to get off, or probably even how to pay. The same is true for the Metro in the few Indian cities that have them. Where is your stop, exactly, and how do you get to your destination from there? Walking is good, and fun, and you’ll see a lot – it is the best way except where distances are too great. Wander at will, starting either at your hotel or at a sight you’ve gone to in a taxi. When you’ve had enough, hail another taxi to get home, or get back in the taxi you came in (it will wait for you). But if you have a specific destination, you’ll need to know your way there on foot, because there are no adequate maps for most Indian cities, except heavy atlases for a few of them. Always carry a bi-lingual hotel card to show taxi drivers – even then they may be illiterate. It would help to have a cell phone so your hotel can tell a pick-up taxi driver where to go. The best way to travel in Indian cities is to use a taxi (or private car) that you will keep for the duration of your outing, whether it is one errand or a whole day. There will be taxis outside your hotel. Your hotel can arrange an English-speaking driver for you who will take you where you need to go, wait patiently for you, and bring you home (or on to the next sight or errand) at very modest cost. This avoids the need to keep finding taxis, and the drivers will be very helpful if they understand what you want. Most people cannot afford this service in America or Europe, but in India you can afford it. Your driver will be glad to re-enlist for the next day, for as many days as you need him. This system has worked very well for me in lots of countries. Make your deal with the driver at the start, and then overtip, rather than agree at the start to an outrageous fare. Your hotel can help here if they find the driver for you – work out the deal in English at the hotel desk, and write it down, and then there should be no trouble at the end. Don’t rely on taxi meters unless you know the details of the conversion tables. Don’t be shy about asking the driver to wait for you, sometimes for hours. He is happy to do it, he is working without even working, it is a soft gig for him and an expected part of the job. The driver will expect you to sit in the back seat, but always sit in the front. You can see more from there. Three-wheelers (motorized rickshaws, tuk-tuks) are everywhere. They are cheaper than taxis, but the cost saving is negligible, and they are rather uncomfortable. But you can almost always find one, even when you cannot find a taxi. Sometimes several drivers clamor to be chosen – I pick the one with the best English rather than the best price. It feels unseemly to set tuk-tuk drivers competing on price, when the price is so low it hardly matters. A tuk-tuk driver who speaks some English and understands what you are looking for will help you find what you need, and patiently wait for you as long as it takes. For short distances you can also use bicycle rickshaws and occasionally even man-powered ones. Pay whatever is asked and then overtip – pulling a rickshaw is hard work! A car and driver is the only practical way to get around outside the cities, except when going from one city to another. And it is also often the best way to get from city to city. You can’t hire a car without a driver in India. Well, you can, but even I, adventurous traveler and daredevil driver though I am, wouldn’t think of driving in India, it is too crazy. Insist (to the hotel desk or travel agent) that you meet the driver before engaging him. Make sure he speaks enough English, and understands and agrees to your unconventional preferences. Get the payment agreed to in advance, in the presence of the hotel representative or the travel agent, and write it down. Otherwise you may find that the daily rate did not include fuel, mileage, state taxes, away-from-home compensation, and as many other exactions as can be imagined. Establish unambiguously in writing what the rules are up front. The driver need not sign the writing. You might wish to agree to reimburse him for fuel. He will be less likely to resist wandering around if he does not feel that every wander costs him money. Your unconventional preferences will be that he not ordinarily take the main highway if it can be avoided, that he not drive faster than 40 kph (25 mph), that he turn off to explore side roads whenever you request it, that he stop whenever you request it, and that he recognize that you are not (like the normal customer) interested in getting from one city to another at top speed. Work this out in advance, and insist on it. After a while the driver will get the point. Aim for the smallest roads. India changes dramatically within 20 feet of the road. And at night insist that your driver use his headlights – Indian drivers hate this, because they think it costs them fuel, but it is dangerous to travel without headlights, especially in India. Sit in the front seat, and whenever you see anything of interest tell the driver to stop. Don’t be bashful about this. There is lots of interest. Make him drive slowly so you can stop him in time. If there is a left turn into nowhere, insist that he drive there. If you pass through a village, stop there. Then get out and look around; take a walk away from the road while your driver waits by the roadside. Getting out of the car is vital to your experience on the road. Expect the driver to resist at first – he is trained to go as fast as possible in a straight line from tourist site to tourist site. But once he understands what you want he’ll be eager to please – he is in the tourism business. Watch the dial and remind him if he starts going faster than 40 kph. Otherwise the blacksmith or wheelwright or limeburner by the side of the road will be long past before you can stop your car. If you aren’t insistent on getting off the roller-coaster, your impression of India will be very skewed. There will be respectable although not luxurious hotels in every city along the way, which your driver can help you find. They will be amazingly cheap by American standards, and some will be quite comfortable. Sometimes your mattress will be very thin. I find the best solution for this is to move the mattress from the other side of the double bed and sleep on both of them together. If you are traveling two to a bed, you may have to call for more mattresses. Although the usual practice is for your driver to sleep in the car, you should instead provide a room for him (sometimes hotels have special cheaper rooms just for this purpose). Doing this preserves a sense of equity, helps morale, and keeps your driver from being exhausted the next day. An exhausted driver in not a safe driver or perhaps an amiable one. There is a tax payable when you cross a state line; sometimes police shake down drivers for bribes. Let your driver handle these episodes without any interference. You should plan to go on at least one car trip while in India. Planes connect two points but you cannot really see what lies between them; you can see out the window of a plane or train but you cannot stop to explore. India is so much more than the high point destinations – to understand India you also need to see the countryside, and the buffaloes, and the village blacksmiths. Make time for a car trip, even if it means you may not get to see all the destinations that interest you this time around. India will still be there next time. If you don’t have time for a long trip connecting two cities, at least do a day trip into the nearest rural countryside. A trip on an Indian train is an experience everyone should have. I used to do it once each time I go, but now that I have had that experience and don’t do it any more. Delhi to Agra is a good one because it is a very short trip, and the road between them is not very interesting. Getting tickets can be an ordeal – have your hotel send someone to buy them for you, or go to one of the thousands of small travel agents whose offices are everywhere. Always go first class (although you will see a lot of local color going third class, it will get tiring fast). Remember that first class seats are assigned – a window seat facing in the direction of travel must be arranged at the ticket window or at the travel agency. Getting to the right platform in an Indian train station, and onto the right train and into the right seat, especially with baggage, can be difficult. I always have my hotel send someone to go with me all the way to my seat, to guide me and help with a porter. Indian trains are notoriously late. It is not uncommon on longer trips (not Delhi-Agra) to stop on a siding for hours, who knows why. Don’t fret – it’s an Indian train. This is a travel experience. I would not recommend an overnight trip on an Indian train. Bring food for the journey (again, not Delhi-Agra), or on long trips you can order food that will be delivered hot at the next stop. You may even be able to eat it – see my essay on how not to get sick. There are also intercity buses. But why do that? There are exceptions, like the sleek tourist buses that go from Jaipur to Jodhpur. But going by car is more interesting. For long distances within India, unless you plan to make an extended exploration by car, I have found it best to fly. India has a well-developed internal airline system that is quite inexpensive by American standards. If you don’t get your tickets before you leave, and why do that, it is often best to book through a local travel agent. This can be done at reasonably short notice, and it gives you flexibility – if you book all your flights in advance you will be locked into a schedule that may turn out on the ground to be too rushed. Remember that internal flights do not always leave every day, and do not always leave from the main airport. There is often a discount for buying internal air tickets at the same time as your tickets to India. And this can be useful – for example if you know you will be ending your trip in Udaipur, you can book your flight back to Delhi in advance. Likewise on a trip where Varanasi was my only destination in India, I changed planes and airlines in Delhi but booked the connecting flight in advance. But in general this discount is not worth constricting your freedom of action by forcing you into a fixed itinerary. I recommend the same basic first-time itinerary for everyone. It assumes arrival in Delhi, because that’s the main entry port (although as noted there are other international airports in India). Then some time in Delhi, and on to Agra (by train is easiest) because Agra is very close and everyone should see the Taj Mahal. Then by car to at least one other place, and after that back to Delhi (or other international departure point) by domestic plane and home from there. Here are some suggestions for visiting Delhi, Agra and Varanasi. What the other place should be depends on what is of most interest. You could go east to the holy city of Varanasi (formerly Benares), or west to the fabulous cities of Rajasthan, or to the South, or north to Kashmir, or to an ashram if that is what you’d like to explore. Choices have to be made, because you can’t conveniently go east and west at the same time (although if a person could do that, India would be the place for it). One thing to remember in planning Indian tourism is that the major monuments of both Delhi and Agra (not counting those that relate mainly to 20th century history) are principally Moslem and Mughal. While spectacular, they are culturally quite similar and not representative of all of India. That’s one reason to go west after Agra, into Rajasthan, where you are into Rajput territory and the monuments have a very different feeling about them, although there are also Mughal sites there too, such as Amber (which you ride up to on an elephant). Jodhpur Citadel is an amazing place, so is Udaipur, and Bikaner (where I haven’t been) is also said to be quite magnificent. Once you get out of former Mughal territory, into the South for instance, the historic buildings look very different. India is an enormous country, nearly as large and complicated as Europe, and there are enough centers of cultural and historic interest to keep a person coming back forever. There is lots to see in Bombay (now Mumbai). I really enjoyed the palaces and the outback of Gujarat. Orissa on the East Coast is another favorite place; the Konark temple complex is there. I liked Konyakumari in the extreme south. I have liked every part of India I’ve ever been to, and I haven’t yet seen Punjab or Kashmir in the north, Assam in the east, Goa or Mysore or Hyderabad in the Middle South, or Madras (now Chennai) or Pondicherry in the South. Study your guidebook and see what interests you. If it’s close, go by car. If it’s not, go by plane and get a car and driver there for further explorations. Include Nepal, Sri Lanka, and Bangladesh as part of India for planning purposes – unfortunately Pakistan is not safe enough to visit at the moment (2013). I have never traveled in India by tour, and I don’t recommend it. Tours are very highly structured experiences. Your time is not your own. Your itinerary is chosen for you, and what you will do in each place. Your time is limited at every stop as you are moved inexorably along from thing to thing. In Agra you see the Taj Mahal and perhaps the Fort, but there is no time for Akbar’s Tomb enclosure, with its herd of antelope and thrilling sanctuary – the bus is leaving. I have occasionally traveled in other places by tour, when it seemed the only way to get access to what I was trying to see. But India is not such a place. Yes, they take care of everything, but you can do that yourself quite easily, for less extra money than the tour costs. Nevertheless many people do feel sufficiently intimidated by what they expect to find in India that they feel they have to join a tour to get to there at all. Perhaps half the people who have asked me about India were booked on tours. If you are booked on a tour, and cannot get out of it and go on your own, I suggest that you not go everywhere the bus goes. Escape the tour every chance you get. Skip the trips to showrooms, for instance – you can use your time better exploring on your own. You can easily get back home by taxi or three-wheeler. When it’s over (or even before), leave the tour. Go someplace else, or stay where you are by yourself for a while, and then go somewhere else. Your hotel or a local travel agent can make your arrangements; elsewhere I explain how to hire a car and driver. The only reason to go back to Delhi with the group would be to take the next plane home – don’t book yourself on that plane, but on a much later one. Maybe it took a tour to get you into India, but once there you can continue on your own. Sounds, smells, colors – India is a kaleidoscope. Open your eyes and nose and ears. The clink of brass-workers’ mallets is among my most enduring memories of India. The colors and smells are more vivid and nuanced than anywhere else. Relax, breathe deeply, and go with the flow. One reason to use a car is to experience the countryside – the cities are only one aspect of India. Most of India is open fields. Indian cities are full of life, but except for a few enclaves like the Lodi Gardens they are not quiet places. Rural villages are not set up for visitors the way they are in Europe. But you can stop and watch what is going on. You will attract a crowd at first but eventually they will move on. Your driver, speaking in the local language (India has 14 official languages) can often get you in to see local factories and the like, and translate for you there. You might want to keep an eye on the birds also. The book to get is Collins’ pocket-sized Handguide to the Birds of the Indian Sub-Continent, by Martin Woodcock (!). There is a bird sanctuary outside Delhi – in Sultanpur National Park in Haryana – which is great if you are interested in birds. It is a good day trip and an interesting journey even if you don’t care all that much about birds. Go by car and engage one of the young men offering to guide you. This is usually not a good idea in a temple of historic site, as they just distract from the experience without adding much value. But in the bird sanctuary it works – the guide will point out more than you would otherwise see. There are bird sanctuaries and mountain lodges and river trips operated by the tourist offices of the states. These are worth investigating and can provide interesting experiences, even if there are usually no tigers around. Also good to see, besides temples, are the palaces of the former maharajahs, many now museums or hotels and fascinating to visit. Museums in the western sense are uniformly fifth-rate, but the palaces and gardens are something to see. Music and dance concerts are held all over India all the time. Many are quite small and informal. They are worth a look. Do all the religious things, sacrifice in all the temples that will let you in, regardless of denomination, even the Moslems and Sikhs and Jains. Always take your shoes off first. God is conspicuously present everywhere in India. Calcutta is the center of Kali-worship, Varanasi is sacred to Shiva, Bodh-Gaya is the main Buddhist center, and Ganesha is especially popular in the south. If one of your goals is to get away and meditate, find a friendly ashram where some folks speak English. This might best be selected, and arrangements make, before you leave home. River journeys are fun also, although the famous Inland Waterway in Kerala is mostly a featureless canal. In Agra and some other places it may still be possible to get around in a horse-drawn tanga. It is the best way to see a city – try to do this if you can. Keep your passport on your person, tucked safely away. Your passport and visa number may be needed for all sorts of unexpected purposes. Bring a sturdy LED flashlight with you; keep it (and extra batteries) with you when night might fall before you return home. Indeed, keep it with you always, in your bag if you carry one, as electricity can go off at any time. I have spent at least a year in India, in the aggregate, and I don’t recall a single day when the power did not go out at least once. Remember, if you have to ask for one, that in India a flashlight is called a torch. Give alms with an open hand in India ‒ rupees all around. You can’t give to everyone, but you are rich beyond the horizons of many of the people you see. Give as much as you can – the amounts can be small – and your place in the Indian scene is to be a generous rich foreigner. Occasionally give an amount large enough to matter. A thousand rupees is only about $20, but that could mean a lot to the beggar involved. $100 could be the out-of-reach down payment on the rickshaw that will let him out of beggarhood. You won’t know – all you can do is be generous. But be careful about giving rupees to kids in a group, or you could get mobbed. And never give money to women who exhibit children as part the begging shtick – it encourages exploitation of children as props. The air in the major cities like Delhi, Calcutta and Bombay is very polluted. You may develop a cough or feel it in your eyes after a while. If you plan to spend more than a week in a major city, try to do it in separate stays, or break up your stay with excursions. The paperback Lonely Planet Road Atlas of India and Bangladesh (2001), and its earlier edition Travel Atlas of India (1995) are very good and quite portable. If you expect to do an excursion out of the city, and you should, one or the other is very useful for planning and for directing your driver. They are out of print now and copies of the 2001 edition usually cost about $45, but Amazon sometimes offers the earlier edition for very little, and you can find it on Bookfinder by searching for it by title, or by the name of the author Bryn Thomas. If in trouble, chant this mantra: Om Kali Durga Nemo Nemaha. It invokes the powerful protection of the Goddess Kali. Her protection can be very useful in India (and elsewhere). Even if not in trouble, chant Om Gang Ganipatiye Nemaha to invoke Lord Ganesha, the god of overcoming obstacles. You may need help overcoming an obstacle or two in India.